The PC market has been going through a few years of declining sales, seemingly lending credence to Steve Jobs’ pronouncement of a “post-PC” era. Smartphones and tablets seemed to be the cause of a downward trend in the popularity of PCs, but then things appeared to be turning around more recently. That upward trend seems to be solidifying, as a number of analysts have been predicting either a stabilization of the market or an outright recovery. 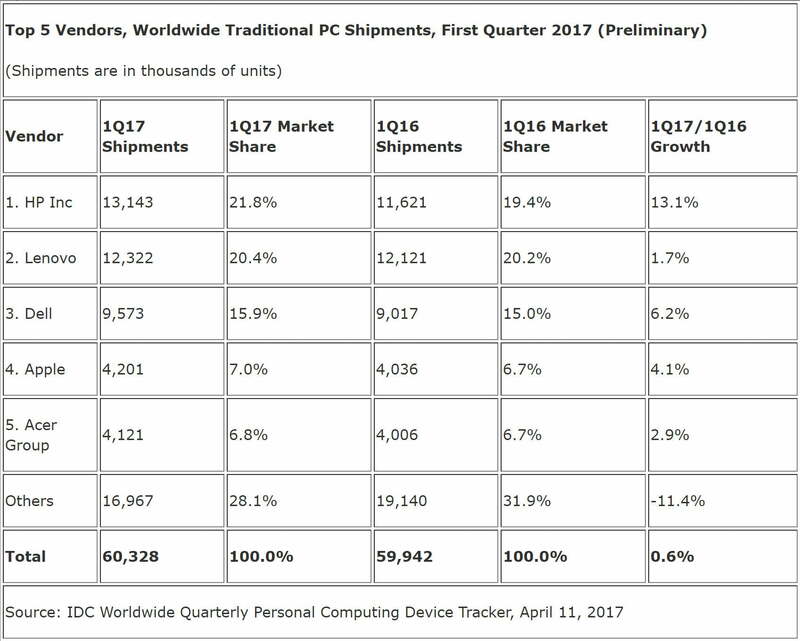 For the first time, we have at least one firm reporting an increase in PC sales, specifically IDC with its analysis of the first quarter of 2017. According to IDC, PC sales for the first quarter reached 60.328 million units, a year-over-year increase of 0.6 percent compared to the first quarter of 2016 when 59.945 million units were sold. HP, with 21.8 percent, took over the top spot of the market from Lenovo, which held 20.4 percent of the market. Dell remained in a solid third place and achieved a strong 6.2 percent growth rate, while Apple’s share increased by 4.1 percent. Going forward, IDC expects PC sales to further strengthen given the beginning of a business replacement cycle, continued growth in PC gaming, and the saturation of the smartphone and tablet markets. Regionally, the U.S. market saw slumping notebook PC sales following a strong holiday sales season along with strong Chromebook sales. IDC notes that these numbers do not include tablets and servers, but they do include detachable and slate tablets as part of the Personal Computer Device Tracker. That means that it’s entirely possible that strong Windows 10 2-in-1 sales contributed to the overall increase although IDC did not specifically address those machines in its press release.